Cherry Mobile is bringing James Reid to Cebu City with the Visayan leg of the two-part Planet ME event happening in SM City Cebu on December 12 and 13. The country’s biggest value-for-money brand highlights the event with the its newest and affordable phones, the Cherry Mobile Me and Me Fun. CM fans and mall-goers will be treated with fun activities, games and array of mobile gadgets that will brighten up everyone’s Yuletide season. For those who are into gadgets, the local tech giant will showcase both handset in the event. For the uninitiated, the Cherry Mobile Me boasts a speedy 1.2-gigahertz quad-core processor, 4-inch IPS LCD display and Android Jelly Bean. On the other hand, the more compact ME Fun treats everyone with Android 4.4.2 KitKat and 4-inch OGS display. Both have 3G connectivity and is priced at Php 2,999. Likewise, both handsets include 4GB of internal memory across the board with up to 32GB expansion option. What’s more interesting in this event is that users can have a chance to customize their own Cherry Mobile ME phone at the three-station Fun Factory booth. The first station allows ME phone owners to bring their own design and patterns to be printed as their device's back-cover, while the second station, lets you pick from an array of pre-designed covers to fit their unique and colorful style. On the other hand, fans of Cherry Mobile’s newest endorsers will be given a special treat at the third station as they can pick their favorite "JaDine" cover to get a chance to meet and greet James Reid during the second day of the Planet ME mall event. 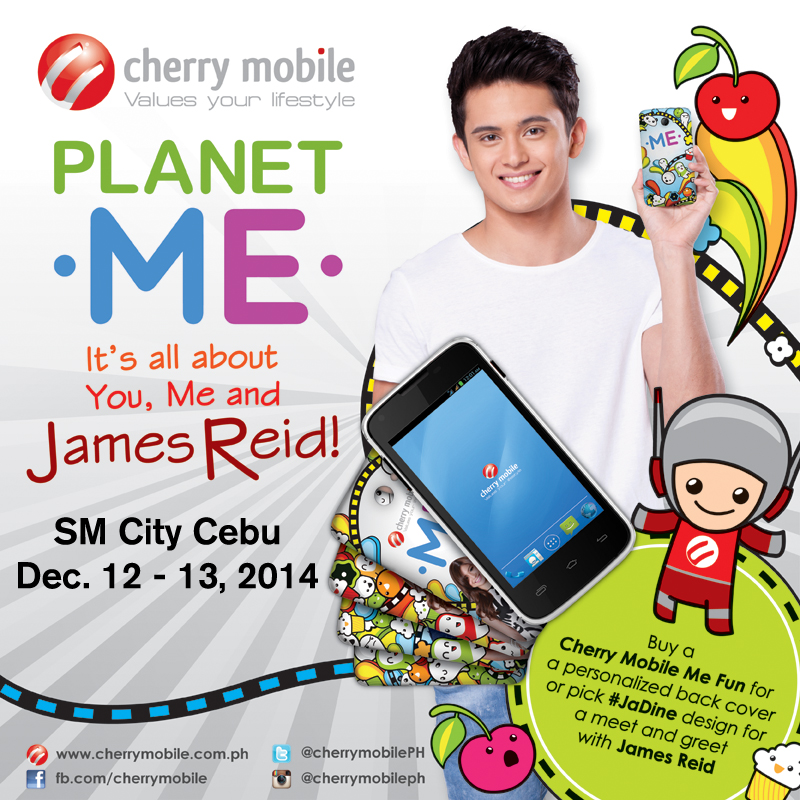 The ME phone series and James Reid will be waiting for you this Saturday at the SM City Cebu North Wing Annex.